This will be the summer of the iPhone. It ships sometime in the next three weeks and everyone seems to be dying to get their hands on it, including my kids. But I have never been interested in an iPhone. 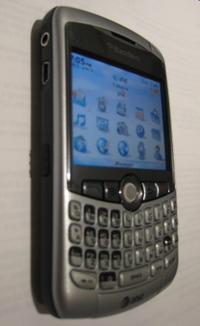 I’ve been a Blackberry fan for almost ten years now and have no desire to switch. I tried switching about 18 months ago, tried every smart phone alternative there was, and came back to Blackberry vowing not to leave again. Of course, that may change at some point, but the iPhone’s not going to do it. The reason is the one that John Markoff alluded to today in his NY Times article. The iPhone doesn’t have a mechanical keyboard. I do not believe that a touch screen keyboard can produce the kind of high speed typing experience I need to be happy with a phone. I use my phone to blog, text, im, email, twitter, and more. I value the keyboard more than anything else on the phone and I think the Blackberry has the best keyboard of any smartphone, with the possible exception of the Sidekick, the only other smartphone that I ever liked. I got my Blackberry Curve today. I bought an unlocked AT&T phone because T-Mobile told me they won’t be carrying the Curve until the end of the summer. Can’t wait that long. I am just getting used to the trackball instead of the scrollwheel. I think I’ll make that transition quickly. This Curve is perfect for me. The only thing I ever really wanted on a Blackberry that I didn’t have was a camera. I’ve got it now. Nirvana. The Gotham Gal and I are giving our old Blackberries to our kids who are switching from Sidekicks. I am hoping they fall in love with the Blackberry too so they forget about wanting that iPhone. Not sure that’s going to happen, but I am sure that I don’t want an iPhone because I’ve got a Curve. Newer post The Big Time Chef In The Age Of Citizen Journalism Older post Has He Been Saving All This Up?